Overview: Welcome back to the continuing adventures of Aunt Petunia’s favorite nephew, Ben Grimm, known better to the world as the Thing. As with any team-up book, this is a very mixed collection of stories. Some stories are one-and-done, while others run across multiple issues. Sometimes editorial would step in and insert a filler issue into the run, as it had already been paid for yet not published. As a member of the Fantastic Four, Ben Grimm seems to be a nexus of events that happen in the Marvel Universe, which works to our benefit as readers! From issues #29 to #33, Ben Grimm and Alicia Masters travels to England, where they get caught up in the early adventures of the Jessica Drew Spider-Woman. Marvel Two-in-One Annual #2 is a continuation of a story started in Avengers Annual #7, with the Avengers battling Thanos. Regrettably, Marvel did not reprint the Avengers Annual in this collection, but it can be found in Essential Avengers Vol. 8 and in Essential Warlock Vol. 1. 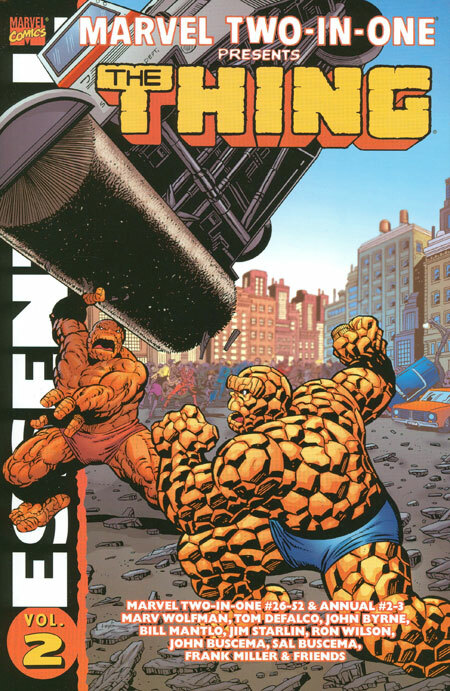 Issue #47 has the Thing “teaming up” with the Yancy Street Gang, the gang which Ben was once a member of many years ago. Over the years, the gang has gone out of their way to play pranks and other tricks on Ben. But when the Thing is attacked, the Yancy Street Gang comes out of the shadows to protect one of their own. What makes this Essential? : I’ve said it before, and I will say it again: Team-Up Books are MUST OWN! This volume is unique with Marv Wolfman’s long run on the title. He had the chance to develop stories running across multiple issues, helping to invest the reader to return each month regardless of the guest star. There are some memorable moments that impacted the Marvel Universe – Spider-Woman’s beginnings, battle with Thanos – not normally seen in the typical team-up book. Please give this a read to understand while Ben Grimm is the idol of millions! Footnotes: As noted in the review for Volume 1, the Fantastic Four and Alicia Masters make numerous appearances in these issues, and could be read side by side with the Fantastic Four title during this era – keep Essential Fantastic Four Vol. 8 and Essential Fantastic Four Vol. 9 handy while reading this book. If you like this volume, try: tracking down a copy of Fantastic Four (vol. 3) #61 (November 2002). In this story by Mark Waid and Mike Wieringo, Ben Grimm is once again the victim of the Yancy Street Gang – or so he thinks! Turns out that most of the pranks he has fallen for over the years were masterminded by Ben’s teammate, Johnny Storm. Finding a receipt for the shop that sent him the latest prank (a pie in the face), Ben stomps off in a mad rage, ready to clobberin’ time the guilty party. Johnny flies after Ben, trying to slow him down and get him to cool off. Ben finally reaches the address on the receipt to find a completely empty lot. He lumbers off, puzzled by how there could be a completely empty lot in the middle of New York City. Only after the fact does he realize it must have been the Invisible Girl hiding the business, saving the Fantastic Four a costly damage bill from another of Ben’s rampages. Waid proves once again why he is a master storyteller, and the energetic art from Wieringo – gone too soon – just leaps off the page. This is a fun story and worth the hunt in the back-issue bin. This entry was posted in Fantastic Four, Marvel Essentials and tagged Bill Mantlo, Jim Starlin, John Buscema, John Byrne, Marv Wolfman, Marvel Two-In-One, Ron Wilson, Sal Buscema, Thing. Bookmark the permalink.